A couple clicks is all it takes to look up definitions--courtesy of Bing--right inside your browser. Remember Accelerators? They were a much-touted new feature in Internet Explorer 8--but I don't know a single person who uses them. Personally, I just never took the time to investigate them all that closely. That may change now that I've tried out Define with Bing, an IE accelerator that's genuinely useful. With just a couple clicks, it looks up definitions of any word or phrase you highlight in the browser. Now, when you highlight a word or phrase, you'll see a little blue-white arrow appear next to it. Click it, then mouse over All Accelerators. In the pop-up list that appears, mouse over Define with Bing--you'll then see a pop-up box with an abbreviated collection of related information. Alternately, if you click Define with Bing instead of just mousing over it, IE will open a new tab with a more complete list of definitions (from sources like Encarta, Wikipedia, and the Web at large). In Internet Explorer, click Tools, Manage Add-ons. 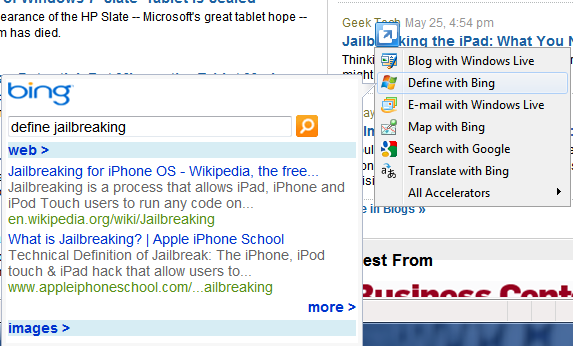 Click Accelerators, and then click Define with Bing in the list that appears. Now click Set as default, then Close, and you're done. What do you think? If you like the cut of Define with Bing's jib, maybe it's finally time you checked out all IE8's Accelerators.